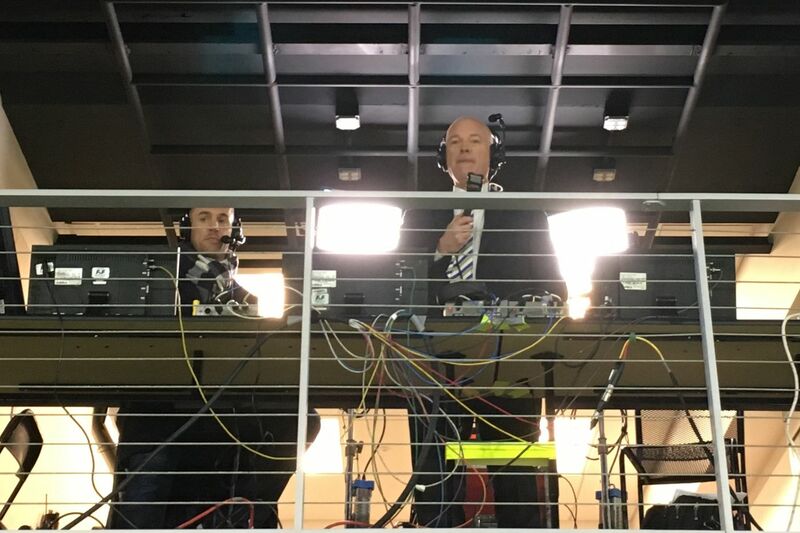 New ESPN Major League Soccer play-by-play announcer Jon Champion (center) surveys the scene at D.C. United's Audi Field during his first game broadcast of the 2019 season. WASHINGTON — After spending decades as a globally-known voice of the English Premier League, Jon Champion began a new era of his broadcasting career this past Sunday as ESPN’s lead voice of Major League Soccer. Before kickoff of his first game, D.C. United vs. Atlanta United, Champion spent a few minutes chatting with the Inquirer about why he made the move, and what’s to come. The conversation has been edited lightly for clarity. How does it feel to be getting started with this? Really exciting. After 35 years of doing top-level football in the U.K., it’s just nice to be facing a new challenge. To have different thought processes to get through, different people to get to know, different contacts to make. And also, I think, an interesting and potentially exciting story to tell with the development of the league at the moment. Was that part of what motivated you to come over here? Just to do something different? Yes, it was. And also to be part of something that’s growing. I’ve been fortunate that my time working in broadcasting in the U.K. has coincided with the birth and then the immense growth of the Premier League, from an interesting concept to a worldwide powerhouse in sports. I’ve been coming here now for five seasons, doing the occasional MLS game. And even in that time, I’ve seen the steep trajectory that the league is heading on. So I just thought now is a really good time to come over. This has been mooted for about four or five years, after I did the World Cup in 2014 for ESPN. They took me out for lunch in London in December of that year and said, “Hey, how about it?” And it just wasn’t right for family reasons at the time. The kids were the wrong age. But this year was the first year when it really was right. And also, in that time, I’ve seen the game and the sport move on here. So it ticked all the boxes. It just seemed the right time to make the move. Which MLS venues have you been to already? Red Bull Arena, Toronto, Seattle, Sporting Kansas City, Gillette [New England], Orlando, Portland. I loved Portland. That just seemed the perfect football ground to me. I was lucky enough to call Seattle-Portland at Providence Park. That was another of the reasons that I’m here now, really, because that was a thrill. Did it make a difference for you that ESPN was the network inviting you over here, instead of, say, a startup looking to make a splash? Yes. And don’t forget that I’ve had a fairly lengthy relationship [with the network]. From 2009 to 2013, I was the lead announcer on the Premier League when they had their U.K. operation, showing live Premier League games there [and in the U.S. too]. Then when that stopped, they were very quickly in touch to invite me to do the World Cup in 2014. And then they gave me a contract to come and do 15, 20 appearances off the back of that, with this thought that eventually, there would be some form of succession and I would come over. They’ve been very good to me. They’ve always made me extremely welcome here. I enjoy working with Taylor [Twellman, the network’s lead analyst] and the production crew. So it just felt right in every respect. Which is not to denigrate any of the other broadcasters over here. I know all the NBC people very well, [coordinating producer] Pierre Moossa and company, because of my work for the Premier League on their broadcasts. I know quite a few of the people at Fox as well. But ESPN are the company that I’ve already effectively worked at for 10 years. So it was a natural fit. If someone had said to you five years ago that you’d be calling Wayne Rooney’s games in MLS, what would you have thought? Well, I suppose there was always a chance. But I’m delighted he’s here. And slightly surprised at how well he’s done. But I think he’s loving just being allowed to concentrate on playing football, which is the thing that’s always driven him. He was a street footballer growing up in Liverpool. That’s all he wanted to do from first light until dusk: just play football in the streets. He’s never happier. And of course here, he has the role that he’s always cherished, which is being the main striker — the one that English clubs, latterly at Everton and before that at Manchester United, decided that he was no longer capable of playing. And arguably, he’s proving them wrong here. There’s been a big move in the other direction, too: Miguel Almirón from Atlanta to Newcastle United. Were you able to take in any of his arrival over there before coming over here? My last game that I called for the Premier League around the world was Newcastle-Manchester City, Newcastle’s famous win at the end of January. That was the night when Newcastle rushed out the news of Almirón’s signing before the game. They were facing insurrection that night because of the lack of transfer activity in the market. I got a taste of it then. And obviously I’ve been aware of Almirón through watching the broadcasts in the U.K. of MLS, and I’ve been really impressed by him and his relationship with Josef Martínez. Of his three appearances so far for Newcastle, two have been excellent. He was rather anonymous at West Ham, but his displays at St. James’ Park, he’s certainly warmed to that, and they’ve certainly warmed to him. Will Almirón’s success help knock down some more of the barriers that American soccer has faced in trying to earn respect in Europe? Yes, but I think those barriers have been being knocked over for a while. It helps that the league now has a regular window on Sky television late on Saturday and Sunday night, because it’s a time when there is no other football on TV. So the viewing figures are actually pretty solid and pretty good for those, and growing. That’s been good in growing awareness of the league. The fact that Rooney’s here, the fact that [Zlatan] Ibrahimović is here, obviously helps. But I think the most positive thing is the fact that the league is now producing players who are being sold for fairly significant sums to European clubs. Not just Almirón, but we look at Tyler Adams going [to RB Leipzig], we look at Alphonso Davies going and immediately getting into the first team picture at Bayern [Munich]. Step by step, those preconceptions, I think, are being shown to be unfair, and people are starting to look at MLS in a much more positive light. I was slightly concerned when my announcement was made in December that I was coming over here, leaving behind a very nice job over there. I was a bit concerned as to whether there might be some negativity in terms of the wider public perceptions of that. I can honestly say that without exception, everyone has come up to me, slapped me on the back, been extremely kind, and said, “What a fantastic opportunity.” So that perhaps gives a little idea of how soccer in America, and its potential, is now being viewed.